We will be closed during the Easter weekend and will be back in the office again on Tuesday. NT-proBNP is an established diagnostic and prognostic marker of heart failure (HF), which is a complex clinical syndrome and health problem that is associated with high morbidity and mortality rates. Save money by ordering antibodies online. You can make your order using the discount code any time between now and 31st of May 2018. We will participate the 15th China Association of Clinical Laboratory Practice Expo held at Chongqing International Expo Center, on 17-19 March. Serum amyloid A (SAA) is often used as a non-specific marker of inflammation. Its concentration in blood increases in response to inflammatory stimulus such as tissue injury, infection or trauma. Heart failure is a severe health problem that is characterized by an increasing prevalence and economic cost. Canine parvovirus type 2 (CPV-2) causes a severe and highly contagious disease in dogs. During the year 2017 in collaboration with IFCC and EFLM through the sponsorships of their awards, we have had an excellent opportunity to show our appreciation towards scientific work in the field of cardiovascular diseases. 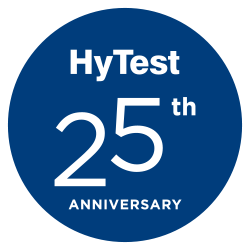 On October 10th 2017, more than 100 visitors came together to celebrate the 5th anniversary of HyTest’s Chinese subsidiary. In Finland, there are currently only 65 assistance dogs in operation. However, more are needed as the waiting time for a fully trained dog is currently several years. If you or your colleagues will attend the MEDICA 2017 - the World's Leading Medical Forum - from November 13 to 16, in Düsseldorf, Germany, please schedule a meeting with us. We have developed three new monoclonal antibodies specific to BNP. SensUs is an international biosensor competition where multidisciplinary teams of students compete on developing molecular biosensors for healthcare applications. During the first half of the year, HyTest’s consolidated revenue grew to 13.1 million euros. The year-on-year revenue growth was 5%. The cardiac isoform of troponin T (cTnT) is widely used as a marker of myocardial cell injury. Our deepest condolences to the victims and their families.